Larry was professor of chemical engineering at MIT from 1962-1990. During his tenure at MIT he pioneered the use of computers in chemical engineering education and was co-founder of CACHE (Computer Aids for Chemical Engineering Education). He was principal investigator of the ASPEN Project at MIT from 1976-1981 that developed the ASPEN software widely used for process simulation and design. Larry founded Aspen Technology in 1981 and served as Chairman until his retirement in 2005. Under his leadership the company grew from a start-up venture to become the leading provider of software for the chemical process industries. The company went public in 1994. Its software is used for design, operation, and optimization of process manufacturing facilities worldwide. Larry and his wife, Beverley, live in Cambridge, Massachusetts. They have two sons and three grandchildren. 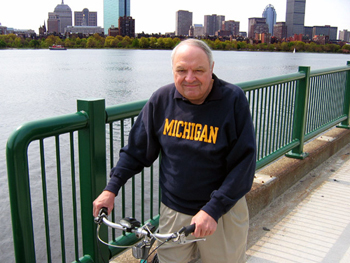 Larry has been a lifelong bicycle enthusiast and can often be seen on the bicycle paths around the Charles River.